Ready to find out your Home Energy Score? Find My Home Energy Score! At Hassler, we believe that helping our customers gain a better understanding as to how energy efficient their homes are is one of the most important parts of our job. This is why we offer an easy to understand Home Energy Score between 1-10 after evaluating the home performance. Energy Upgrade California Home Upgrade program helps you make home improvements that can save energy and make your home more comfortable. These whole home rebates, up to $5,500, reward you for addressing your home energy efficiency needs as a system instead of piece by piece. Hassler is your local, full service, trained and certified home performance experts. There are many advantages to choosing Hassler as your source for heating and cooling installation and service, including the fact that we are locally owned and operated. ....Mike impressed me with his professionalism, attention to detail, and his ability to explain clearly what my options were and how the furnace installation would be performed. His bid price was competitive, too. Mike, apparently Rene and your team did such a good job the rebate is even a bit higher than expected. Thanks for the good work. They took out our wall furnaces and installed an energy efficient 2 zone heating system. Mike explained his whole process step by step and provided me with many options. I was very pleased with the work they did and would recommend them to anyone. Fantastic company to work with, great service & reasonable prices! We moved into our current place & the air conditioning conked off within weeks! We interviewed & got quotes from several companies, Hassler gave us the best deal by far. Just got our central heating put in and it has been an excellent experience thus far. For the majority of the install process had Max and Edgar at the site and they were extremely professional, courteous, clean, and on time. Hassler Heating and AC really pulled through for me. I'm a landlord and one of my tenants reported that the HVAC system went completely out right during the hottest week of the year. Just completed first annual inspection. Chris was professional, responsive, timely, and easy to work with. Hassler Heating is a terrific company! Their skills, professionalism, teamwork, and efficiency exceeded anything I could have imagined. Everyone I met was skilled, pleasant, competent and really committed to doing a great job. "Hassler Heating has always done a great job whenever I needed to call them. They are the only company I would call to service our Heating/AC unit. Paul came out yesterday to service our AC unit, he gave me a call ahead of time to let me know his ETA. "Hassler replaced our entire house heating system and was one of the best companies we have ever hired for anything. Just great and so considerate and professional. Every contact was excellent, each employee was helpful and informative. They are true problem "solvers". "Hired Mike to replace a heater and install a new air conditioner. The team did an outstanding job. They were professional, reliable, dependable, fast and left the area cleaner than when they started. "The only good thing about all that rust in my water was calling Hassler. I got a new tank for a decent price and great customer service. The install took longer than expected because whoever installed the last one did some very odd things. But Hassler stuck to their estimate. "Hassler HVAC: quick diagnosis and a quick fix. Derrick is "The Man". Quick diagnosis (less than 20 minutes) of a problem that turned out to be simple, but not at all obvious. Quick repair (less than 40 minutes). I chose Hassler HVAC after talking to a few HVAC & insulation contractors about upgrading my house's insulation, heating, and water heater. These guys looked at the whole picture, gave great options & suggestions, had fair prices, and were always professional. "Great service. After installing the system two years ago, they called me to setup a follow-up maintenance check. Chris is a very professional and courteous person and great to work with." "We've had our central heating die twice since 1991 - and of course, both times it was right when the Bay Area got socked by those rare two-week Alaskan freezes! "My wife and I moved to the area buying a townhouse in 2010, with a twenty-one year old gas furnace. Each heating season we had problems with the furnace, with a couple of different HVAC companies replacing parts, but with the problem soon recurring. Chris just came out and inspected a furnace and ducting for me at a property that clients of mine are purchasing in El Cerrito. He was very knowledgable and was sure to take the time to answer all of my questions thoroughly. The condenser unit at our house went out the Sunday before Labor Day, just before a week of 100 degree days. 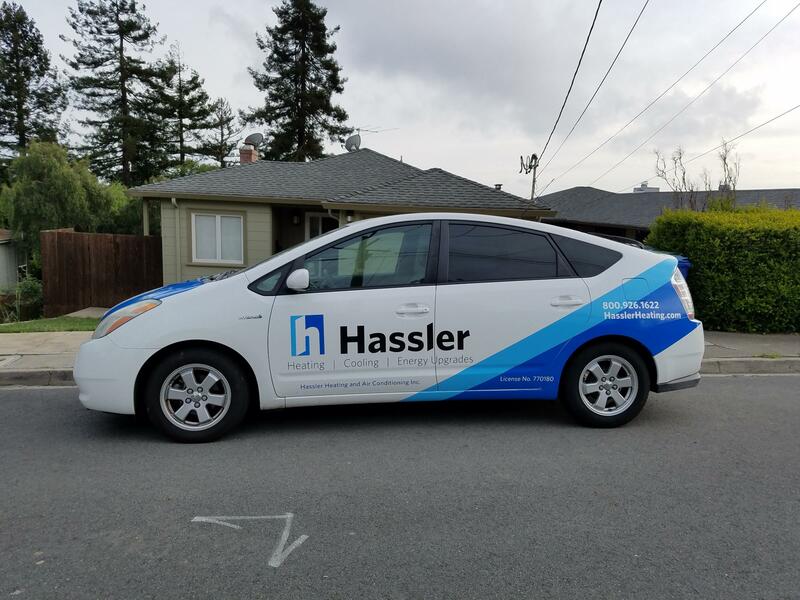 I called Hassler and was surprised to have someone pick up the phone, and happy to be able to schedule a next day appointment. Hassler Heating went above and beyond customer service! My AC unit started smoking and I called to make an appointment and they were able to fit me into their schedule that day! How To Get Comfy At Home: Say “Hello” to “Hygge”!